So… a Mission Impossible movie makes Mission Impossible money! Hooray! That should be Detective Dee and not Doctor. So Mowgli is going to Netflix instead of theaters. The project always sounded sort of Pan-y (Panesque? ), but there is no way they are getting fully reimbursed for what I understand was quite a pricy project. I expect Fantastic Beasts to be a Solo Level disappointment and Aquaman to be the straight out flop of the year. So do you think they were trying to minimize the PR damage that would come with another flop? And I say this expecting Star to do beyond gangbusters business, up with Coopers other big hits. Does anyone else think the fanboy/girl-heavy Xmas slate is ridiculous? …and don’t forget “Untitled Warner Brothers Event Film #2″ (whatever the f**k that means). Does anyone really think it’s a good idea to release ALL of those “same-demographic-skewing” movies at the EXACT SAME TIME? And the lack of wide-release alternatives–i.e., movies adults might want to actually leave the house to see–is positively staggering. “Hot Summer Nights” is wildly derivative, but it’s derivative of a style (of movie) and a filmmaking period (the ’70s) I have a lot of affection for. Mowgli was doomed the minute Dinsey’s Jungle Book broke $900 million and got killer reviews. I’m honestly a bit relieved they aren’t pretending otherwise. Yes movies on the same subject can succeed (Asteroids! Alien invasion!) but on the exact same story?? If there are good examples of that I’m not remembering them. Sometimes someone has to win the race. I don’t think Fantastic Beasts will be quite a Solo level disappointment, as international should prop it up. I don’t see it growing though. And it will lose audience, considering the general public seemed to leave the first one with pleasant indifference. Not great considering WB wants to make, what, five of these? They’re trying though. They’re pushing the hell out of Jude Law and Johnny Depp, after Eddie Redmayne made next to no impact (he’s coming across as an after thought in the franchise now). Eh, first one was dull and a lame cash grab. I’d love to see the franchise go belly up. WB could and should do better. Aquaman? Who knows. Suicide Squad was a piece of garbage and made $700 million off a cool trailer. Mirror Mirror/ Snow White and the Huntsman. March/June 2012, comes to mind. 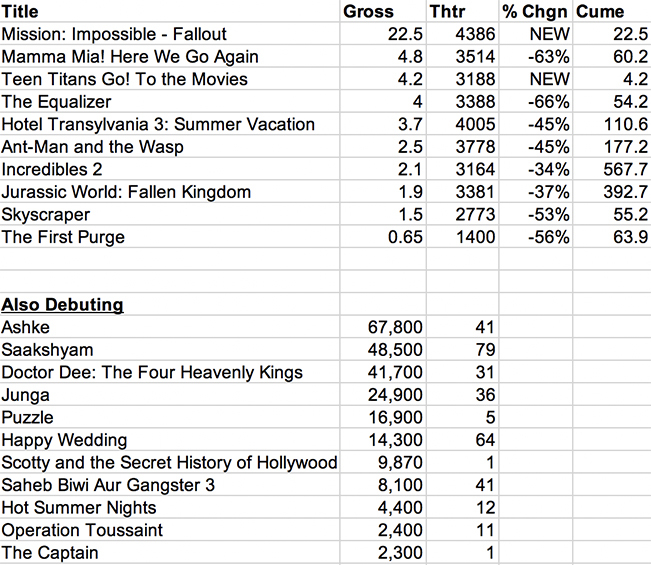 Don’t know whether Mirror’s $183m worldwide on an $85m budget was considered a disappointment or break even. Huntsman did $396m on a $170m budget. The Crimes of Grindlewald will make a couple of dollars, but I am not sure it’s going Solo levels. It may, if Depp goes even creepier and worse as a human being, but right now? It actually looks like a more entertaining movie than the original. The funny thing with Mowgli, is Netflix GIVING SERKAIS MORE MONEY to complete it. They want to have a solid movie for once, so that’s a plus. Some film opening around Xmas, should move to the December weekend, that we dare not speak its name. It’s the only thing that would make a lick of sense, because there is only so much money to go around during Xmas. Yeah. Yeah. Star Wars, but none of this is Star Wars, and we all know Mary Poppins is going to kill it. Everyone else is going for second like Aquaman. James Wan gets horror, but making an 80s dayglo comic book movie for 2018, is just asking for some problems. If that movie succeeds on any level, then Walter Hamada should consider himself lucky. If Aquaman makes anything above 500m. And Mortal Engines is basically Snowpiercer. And as for closet competitors I would have to go with Dangerous Liasons and Valmont. Warner’s in that mix as well. “Bumblebee”–which would make more sense Martin Luther King Weekend in January–actually seems preferable to the icky-looking Zemeckis. And the Miller/Lord “Spider-Man” ‘toon seems like an early February-ish title. See. It’s not that hard to bump things around and avoid Kamikaza Comic Con Christmas 2018. As to the logjam of product this Christmas, you ain’t seen nothing yet. Next November / December brings Frozen 2, Wonder Woman 2, James Bond, Jumanji 3 and Star Wars Episode 9 in the space of seven weeks. Next Winter is going to be absolute carnage. While I was obsessing about the bleuch Xmas line-up, Annapurna moved Linklater’s “Where’d You Go, Bernadette?” from October to (an allegedly “wide” release) late February. And oh by the way, MI:Fallout is simply terrific.